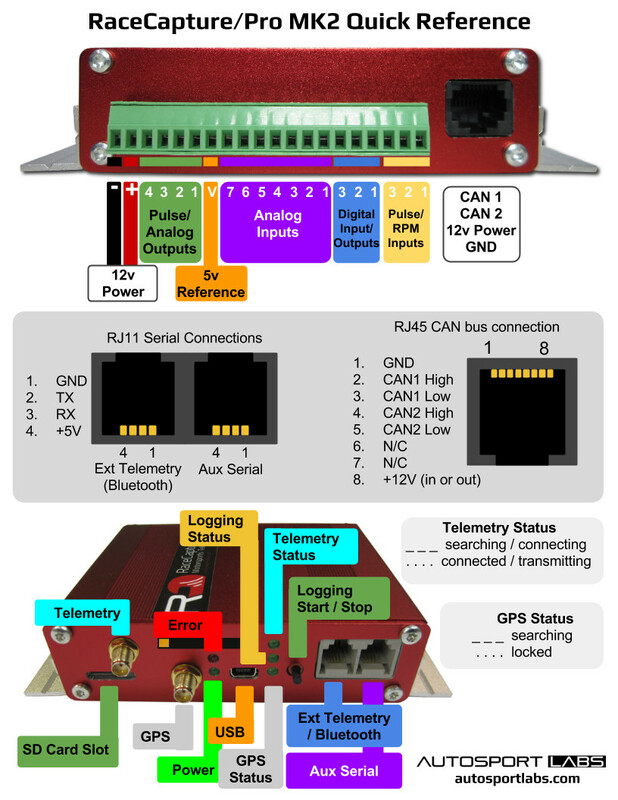 Autosport Labs :: View topic - RJ45 connector wiring convention for RaceCapture/Track? Autosport Labs Forum Index » RaceCapture/Track Operation » RJ45 connector wiring convention for RaceCapture/Track? RJ45 connector wiring convention for RaceCapture/Track? What is the RJ45 connector wiring convention for the RaceCapture/Track MK2? Is this convention standardized across all Autosport Labs devices? So it would be like this? I assume the RJ45 CAN bus connection pictured above is from perspective looking into the device side female receptacle? Yes, but that page only lists the wire colors, not the pin numbers. I suppose it assumes there is a coloring convention when inserting wires into an RJ45 connector. The numbering in the picture above is from perspective looking into the RJ45 receptacle on the device, correct? That is correct, ithe pinout is dentical to RaceCapture/Pro.